Volunteers are needed to help build sleeping pods for the Clackamas County Veterans Village. 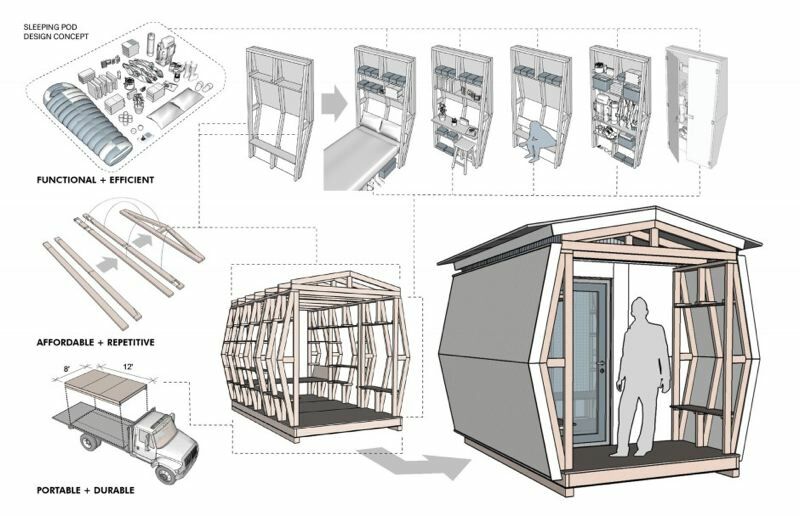 Help architecture students from Portland State University transform this summer's Treeline Stage at Happy Valley's Pickathon Music Festival from a venue for 18 musical artists into the sleeping pods for homeless veterans. The sleeping pods will be constructed from the stage's wooden trusses. Portland architecture firm SRG Partnership designed and installed a prototype for the sleeping pods at the Kenton Women's Village in June 2016. Communitecture will lead the Clackamas County Veteran's Village building process and collaborate with PSU's Center for Public Interest Design to design the village site. Organizers are seeking volunteers to help build the first 15 sleeping pods at the county's Red Soils Campus in Oregon City, near the Juvenile Center at 2121 Kaen Road. No technical skills are necessary, and needed tools and equipment will be provided on-site. On Aug. 16, Oregon City commissioners unanimously declared an emergency to exempt Clackamas County from the city's code requirements as the construction takes place. City commissioners passed this resolution for the county because the tiny homes will help achieve the city's goal to work with regional partners to identify tools and programs to increase affordable housing. People who would like to volunteer for various construction tasks can register at cityrepair.org/cc-vet-village. Since the site will only accommodate 15 volunteers per shift, not all volunteers may be able to get their first shift choice. Volunteer shifts are available from noon to 5 p.m. Wednesdays, Thursdays and Fridays, and from 10 a.m. to 1 p.m. and 2 p.m. to 5 p.m. Saturdays and Sundays. Last fall, PSU collaborated with homeless advocacy groups and architecture firms like Catholic Charities, Communitecture and the Village Coalition to address Portland's homelessness crisis. That initiative produced 14 sleeping pods that became the Kenton Women's Village in North Portland. Working with the same organizations, the pods made from the Treeline Stage will follow a similar path. Once constructed, the tiny homes will be transferred to a county-owned property at 115th Avenue and Jennifer Street, in the unincorporated Clackamas Industrial Area. The Clackamas County Veterans Village will contain up to 30 sleeping pods, along with community facilities for kitchens, showers and restrooms, and a community room. Residents will be involved in governing the community, and will have on-site access to social, behavioral and physical health services. Clackamas County officials hope to offer the veterans shelter, security, safety, skill-building opportunities, and a chance to build confidence in a village setting.